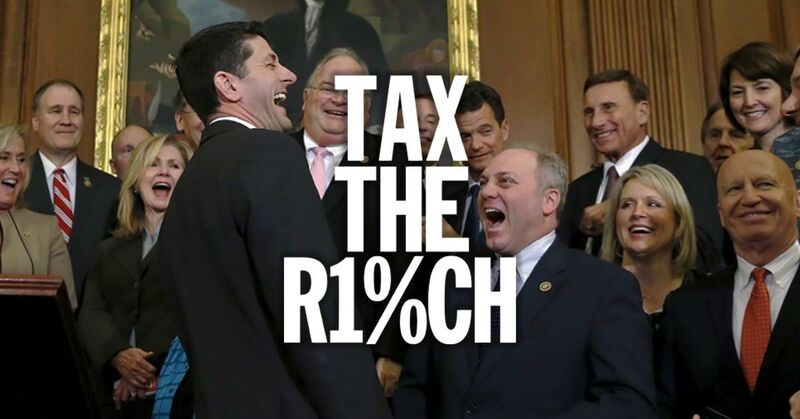 Republicans in Congress just passed a massive tax cut for the 1% and corporations. Now they’re saying out loud that they plan to use these cuts as an excuse to destroy the social safety net by slashing Medicare, Medicaid, and Social Security. Not if we have anything to do with it. We’re calling on Congress and elected officials across the country to stand with working families by reversing the Republican tax scam and making the mega-wealthy and corporations pay their fair share. And if they don’t listen to us, we’ll vote them out in 2018. Will you join us? Sign our petition to Congress: Repeal the Republican tax scam and tax the 1%. Not only is the Republican tax scam massively unpopular, but a majority of Americans think that the super-rich and corporations pay too little in taxes. In fact, most Americans want taxes for the 1% to be raised, not lowered. It’s no surprise why Americans want the super-rich and corporations to pay their fair share. People are angry about income inequality. Most Americans are working harder than ever, but are living with stagnant wages that can’t even cover the basics. All the while, the super-wealthy are getting richer and attacking the government programs we count on. The Republican tax plan will make income inequality even worse. According to one independent analysis, the mega-rich will see their incomes increase by 3%. The bottom 50%? They stand to see their yearly income drop by 2% by 2027. But instead of listening to what most Americans want, Republicans in Congress raised taxes on the middle and working class while slashing them for their rich and corporate donors. We need to defeat them in 2018 and elect a wave of progressive candidates who will join our call to repeal this disastrous bill and make the 1% pay their fair share. Are you in? Add your name: Repeal the Republican tax scam and tax the 1%! I was number 70 at my polling location 20 minutes ago. Go vote!